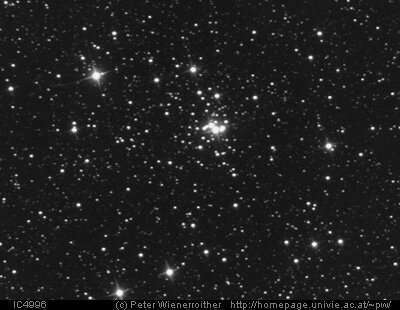 Open cluster IC 4996. Credit: Peter Wienerroither. Using the Vatican Advanced Technology Telescope (VATT) and data from ESA's Gaia satellite, astronomers have conducted a new study of the young open cluster IC 4996 and its vicinity. The research, presented in a paper published January 31 on arXiv.org, reports more details about properties of this cluster. IC 4996 is a young open cluster in the constellation Cygnus, believed to be a member of an OB association known as Cygnus OB1 (or Cyg OB1), Although numerous observations of IC 4996 have been performed to date, its distance and age remain uncertain. Some studies suggest that it is located about 5,400 light years away from the Earth, while other papers estimate that it may reside as much as 2,400 light years farther. Similarly, its age estimates range from 6 million to 9 million years in various studies. In order to resolve these discrepancies and to learn more about the nature of IC 4996, a group of astronomers led by Vytautas Straizys of Vilnius University, Lithuania, conducted their own study of this cluster. For this purpose, they used the 1.8-meter VATT telescope located on Mt. Graham, Arizona, and data from Gaia's Data Release 2 (DR2). Published in April 2018, DR2 contains high-precision measurements, including positions in the sky, parallaxes and proper motions for more than 1 billion sources in the Milky Way galaxy. Such information is crucial for determining distances and ages of stars more accurately. "In this article, we attempt to determine the parameters of IC 4996 with new spectroscopic MK types of the brightest stars and two-dimensional photometric spectral types of fainter stars based on their CCD photometry in the Vilnius system and individual dereddening," the astronomers wrote in the paper. The study reveals that the Gaia parallax of IC 4996 is 0.522 mas, which corresponds to a distance of 6,243 light years. The age of the cluster was estimated to be between 8 million and 10 million years. Given that the distance to Cyg OB1 is known to be about 5,483 light years, the researchers noted that IC 4996 is most likely not a member of this association. However, they added that this cluster more likely has a common origin with the Cygnus OB3 (Cyg OB3) association, which is located between 5,870 and 6,500 light years away. Furthermore, the research found that the interstellar extinction (dimming due to the presence of dust in the interstellar medium) of IC 4996 covers a wide range of values, from 1.3 to 2.4 mag, while the mean value in the central part of the cluster is 1.8 mag. The authors of the paper also noted that DR2 dataset allowed them to identify 72 new possible cluster members. In concluding remarks, Straizys' team emphasized that their research proves that a two-dimensional classification of stars based on multicolor photometry, together with astrometry from Gaia, can be applied for obtaining physical parameters of open clusters. According to the researchers, the study also shows that boundaries of stellar associations should be revised.